We are a group of volunteers who are part of Essex Land Rover club and offer their vehicles and time during periods of bad weather or major incident. We are usually called on by Essex County Council Emergency Planning team but can be called out direct by other essential services. We are a member of 4×4 Response UK which is the national body for all 4x4 Response groups in the UK. As our name suggests we cover the Essex area but a mutual aid agreement exists between all groups to assist other teams if required. 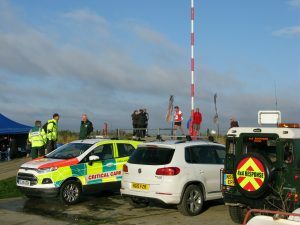 We are part of the Essex Voluntary Network, along with other category 2 responders such as St. John Ambulance, Red Cross, Samaritans, Raynet etc. We can work with Emergency Planning and all the blue light services i.e. Police, Ambulance, Fire and Coastguard. Alternatively we could be asked to support other volunteers by transporting their equipment and personal. Any make or model of 4x4 vehicle is fine for 4x4 Response work, depending on the request the team controller will despatch the most suitable vehicle for the task. There are a few simple requirements for the vehicle such as recovery points, basic recovery kit, hi viz, torch etc. There should be no need to spend much money or adapt your vehicle as the majority of the incidents we attend involve transporting people. Membership of Essex 4x4 Response is possible in two ways, if you are already a club member then you can join the team by just completing an additional form. If you just want to participate in 4x4 Response and charity event support activities there is a new class of membership at a cheaper rate which is now available. This one doesn’t allow you to take part in any other club activities, receive a copy of Exploits or to vote on any club matters. Transport for health service workers and carers out to patients. Picking up control staff who can’t get into work. We hold regular training events for all team members so we know everyones capabilities and any training / equipment required. The training days include, mapping and navigation skills, communication, vehicle recovery and team management procedures. The Essex Resilience Forum is a multi-agency partnership, made up of local councils, emergency services, health providers, the voluntary sector (that's where Rover Rescue comes in) and many more organisations - working together to plan and prepare for a multi-agency response to a major emergency.